What is the Content Deduplication tool? It’s a one of it’s kind mechanism that helps you efficiently manage your travel inventory across multiple sources (directly contracted hotels and 3rd party XML suppliers) by allowing you to create your own database and avoid content duplication. Using our deduplication tool you have the chance to build your own database of hotels, to have your own unique content written for the best SEO positioning and not a replicated one which may be found in the search engines from tens of other travel websites. Our Content Deduplication / travel content mapping tool contains two complete modules (destination and hotel) and is fully integrated with our B2B and B2C booking systems, at the same time being able to be successfully exported/imported and used in any other Online Booking Engine available on the market. The most important capability of our deduplication tool is that you can use it to create your own database of multilingual properties in spite of the fact that suppliers usually do not offer data outside some of the major languages, such as English, French, German, Spanish or Italian. Our tool allows you to have room descriptions, facilities, room types, hotel descriptions and image names in your desired language, thus improving your chances of selling in the GCC or Asian markets. More than this, while you are creating your database, the tool facilitates you to choose which particular fields get synchronized with data from a supplier, for example you can choose to write your own hotel name and description, add pictures from GTA and facilities from Tourico. Mapping (deduplication) of destinations allows you to create your own geographical tree of destinations and to divide certain destinations in areas which your clients have interest in so their searches would be easier and more intuitive. By default wbe.travel’s destination mapping divides each destination into 2 areas – the main city area and the airports areas of that city. 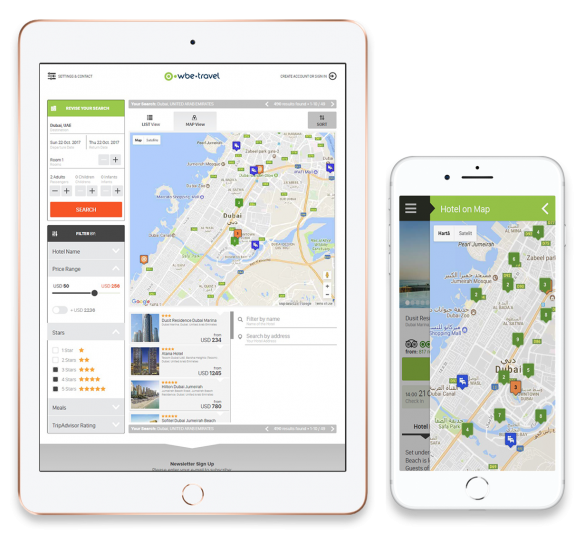 This tool offers you the possibility to add sub-geographical areas to any city you desire and increase your clients’ searches and sales (for example add Lower Manhattan to New York City).